Is there a point at which a “movement” actually hits bottom? You know: like an addict? My only true experience with this was observing the British left in the 1970s and 1980s, reacting to the tectonic shift toward less state control in Britain and America. Instead of examining their own biases, challenging their own assumptions and thinking constructively about policy, they simply began talking to each other, split into factions, and, with each passing day, they got loopier and loopier. American liberalism had a less surreal intellectual collapse as well – degenerating into interest group leftism, as Reagan re-made the polity. Reading the current conservative press (with the obvious exception of The American Conservative), it’s hard not to see the parallels. What was once Joe-Farah-style looniness is now mainstreamed; Newsmax is all over NRO; David Brooks’ idea of a revived version of early neo-conservatism is almost poignant in its level of denial. There appears to be nothing ever too far to the right, and the fervor of the true believers increasingly eclipses the worries of the doubters. Reading conservatives like Pete Wehner or David Brooks feels worthy but irrelevant. Watching conservatives like George Will and Charles Krauthammer effectively go over the cliff with the party is just dismaying. Seeing Peggy Noonan morph into Michelle Malkin may be entertaining in its incoherence, but it’s still not good for the republic. Probably. But why all the question marks? And then you begin to inquire further and your eyes widen a little. A few paragraphs into reading the debate, you realize that all of this is connected with the claim of a current huge conspiracy lying in plain sight – the Muslim Brotherhood’s grip on the White House. Obama is a closet Islamist, just as FDR was a closet Stalinist. It all makes sense now! If you’re like me and steeped in this kind of ideological stew for a few decades, you immediately check on the slightly calmer voices in the anti-Communist historical universe. The result is both a relief – not everyone has gone bonkers – which is followed by more dismay, as you realize that even the people who lived their intellectual lives as passionate, revisionist anti-Communists and anti-anti-anti-Communists are now outliers in the conservative ranks. As a historian I normally would not have agreed to review a book such as this one. But I changed my mind after seeing the reckless endorsements of its unhinged theories by a number of conservative individuals and organizations. Incidentally, Joe McCarthy was right. How about the fact that a number of mid East advisers working in the sate department [sic] are connected with CAIR or the Moslem Brotherhood? 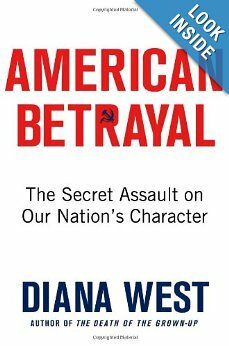 Where West’s contribution differs from anything else, thus far available, is that in addition to assimilating all of the most important aspects of the Soviet infestation she illustrates a parallel action on the part of the Islamists today. An understanding of the current Islamic penetration into our society, government and culture alike, is vitally important, and should be readily apparent. History that I never got in school.